When using factoring companies for real time cash flow assistance, you can expect to get paid approximately 85-90% of the total value of a customer invoice after you have raised it. You then get paid the balance when your customer settles up, with a month end service charge automatically debited from your balance payment. You are also liable for a month end discount charge, like an interest payment, on the borrowed sum. Whilst you naturally remain responsible for the raising and dispatch of your customer invoices, your invoice factoring provider takes over the credit control side of things for you. Thus, you accompany your customer invoices with what are known as notices of assignment, which give notification to your customers that their debts belong to someone else rather than you. The tall and short of invoice factoring is that it provides you with ready sources of finance that are secured against your debtors list. Your advance is made as soon as you have fulfilled work for your customers and raised their invoices, with your balance being settled when your customers settle. Service and discount fees are deducted from final balance payments. Factoring companies additionally offer credit control and reconciliation services. Funding is offered by a broad range of High Street banks, private individuals and small independents. Invoice factoring does not differentiate between the sectors and sizes of businesses, whether you are a self-employed sole trader, a small independent business, or a large global organisation. Whilst sectors and sizes may differ dramatically, what many businesses across the board often have in common is that their debtors’ lists represent their greatest assets. This makes it optimally important to find and select an experienced, proficient and reputable invoice factoring partner. Continually evolving amounts of factoring companies can make it tough for you to sort the wheat from the chaff. Yet an inappropriate selection can impair the growth of your business and even damage your future prosperity. We, at Invoice Finance Scotland, are delighted to say that we make positive differences to dozens of very different companies on an annual basis. Recourse and Non-Recourse invoice factoring – the fundamental difference between recourse and non-recourse invoice factoring is that recourse invoice factoring encompasses bad debt protection, whilst non-recourse invoice factoring does not. Bad debt protection is a very similar concept to credit insurance. Some businesses find that its inclusion offers them invaluable safety nets for which they are prepared to pay a little bit extra. The coupling of invoice factoring with bad debt protection in to a single package also often saves them money, rather than the sourcing of further separate independent insurance. Other businesses opt for non-recourse invoice financing when bed debt protection is not their priority and they prefer the cheapest option available. Domestic and Export invoice factoring – whilst domestic invoice factoring covers UK debts, export invoice factoring covers overseas debts. Businesses that deal with customers both at home and abroad can opt for several simultaneous lines of currency. Confidential invoice factoring – confidentiality provides a peace of mind option to businesses that want to take advantage of the credit control services included in invoice factoring, yet prefer to conceal it from their customers. Whilst the overall process is largely identical to regular invoice factoring, confidential invoice factoring is well suited to businesses whose customers may have truck with third party involvement due to contractual issues. As such, confidential invoice factoring retains credit control and reconciliation services, which are fulfilled under the guise of businesses rather than factoring companies. Client Handles Own Credit Control Systems (CHOCCS) – invoice factoring on a CHOCCS basis offers businesses regular services, but without the provision of external credit control. Single invoice factoring – the genuine flexibility of single invoice factoring offers a very attractive solution to businesses requiring upfront funds for single transactions. It is regularly brought to the table when long term financial agreements are requested by particular customers, enabling businesses to offer customers required terms without jeopardising cash flow. 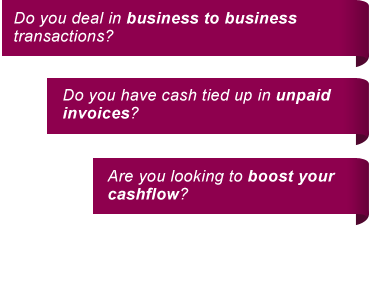 Single invoice factoring can also offer businesses the helping hand they need in order to fulfil single large orders. Recruitment finance – sector specifically designed and formulated to match the need of recruitment businesses, recruitment finance represents a back office in a box. Its features include payroll, besides invoice factoring and partnering credit control services. High Concentration and Single Debtor Finance – businesses dealing with many different customers fall in to the high concentration bracket, whilst those that deal with only one or two are single debtor cases. Funders sometimes favour the limited risk potential presented by high concentration businesses, due to the sharing across broad customer bases. Single debtor businesses can be penalised for the higher risk presented across far fewer customers.